With people to save and the Doctor trapped, Clara goes against an enemy that exists beyond human perception. So, how good was this episode? 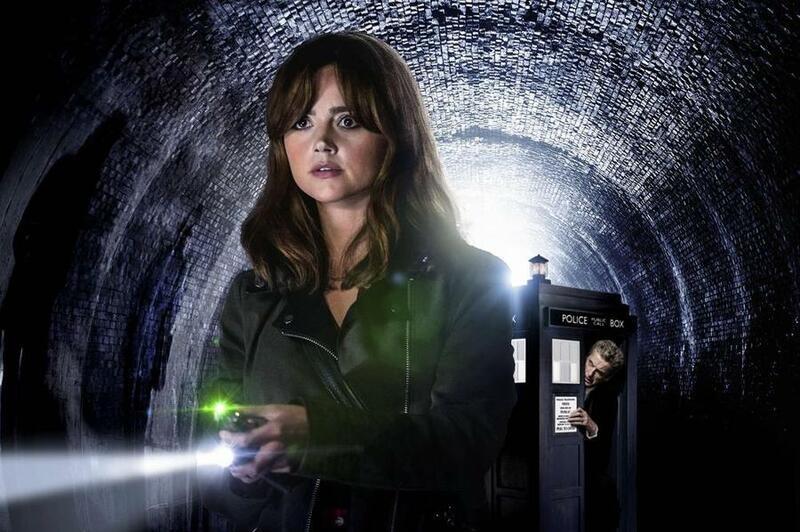 Flatline sees Clara take center stage, thanks to the Doctor being trapped by an alien force. Add to it an original and creepy group of monsters and a top-notch script, and Flatline just might be, when all is said and done, one of the Twelfth’s Doctor “essential” episodes. After last week’s solid Mummy on the Orient Express, writer Jamie Mathieson takes us to a sparse council estate on the edge of Bristol. It’s a setting Matheson knows well, as he penned several episodes of the BBC series Almost Human which took place in the same location. The location works to the story’s benefit; a rundown council estate, a rusting industrial area, and a series of abandoned subway tunnels help to establish a very nice variant of the “base under siege” setting. No one is coming to help (least of all the disinterested police), putting the characters on their own against the threat of the two-dimensional creatures known as the Boneless. And how about those Boneless? A brand new threat from another plane of existence, the viewer doesn’t know if the Boneless are explorers, lost travelers, conquering invaders, or just hostile 2-D psychopaths. Experienced Who director Douglas Mackinnon (The Sontaran Stratagem/The Poison Sky, The Power of Three, Cold War) does a standout job with the presentation of the Boneless. At first, they slither across the walls and the floor towards their prey, in one case sucking a policewoman into the carpet and leaving a layout of her nervous system on the wall as a tree-like mural. As they study and dissect their victims, they slowly become three-dimensional, moving in a blurry, jerky manner as they stalk their prey. The design of the three-dimensional Boneless is unnerving, like watching a old VHS cassette held together by Scotch tape, the video image jerking and skipping with every passing moment. It could have been easy for Mackinnon to keep them in the shadows, but instead he keeps them on screen just enough for the viewer to be unnerved. The Boneless are definitely a “jump behind the couch” creature that will both scare and delight young viewers of the show. 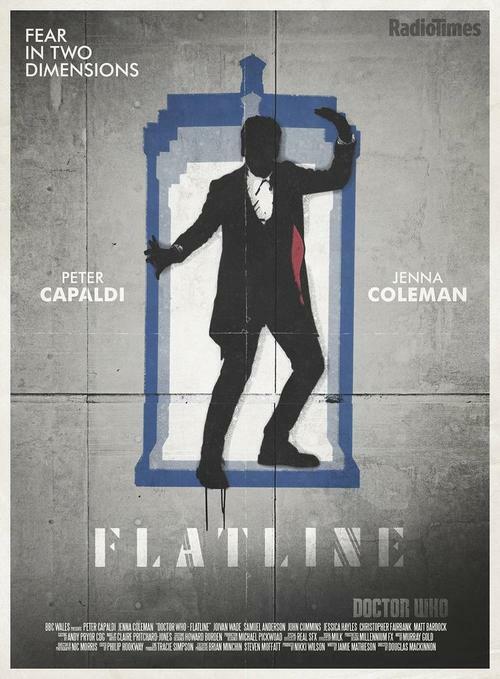 The tension of the story is well balanced by the comedic aspects, including a literal use of the concept of “hammerspace!” The second half of Flatline is very much a nail-biter, but the creepiness of the first half is mixed in with some very funny moments. The episode takes the idea of the Doctor trapped in a tiny TARDIS and milks it for all its worth. Capaldi’s face peering out from the small doors, one hand reaching out to give Clara the sonic screwdriver and psychic paper, and even the tribute to The Addams Family as the Doctor’s hand “Things” his way across a set of train tracks to safety. But we can’t forget the one-liners as Clara tells people to call her “The Doctor” as Twelve growls “don’t you dare.” It’s refreshing, just for one episode, for the Doctor to see how he actually is with people, and how Clara channels him for both comedic and, later on, dramatic effect. The Doctor takes a backseat in this episode, trapped inside the “shrinking, but not shrinking” TARDIS. Even when confined to his control room, Capaldi’s Doctor is still in motion, running up and down steps, throwing on a pair of steampunk jeweler’s goggles, and constantly providing information and commentary to Clara throughout. Moreso than last week’s Mummy on the Orient Express, this is the Doctor in scientist mode, trying to solve the puzzle with both his life and the lives of countless others at stake. It’s a fine performance, even if the Doctor never quite comes out and says how he can send the Boneless back to their 2-D universe. But when he does so, Capaldi knocks it out of the park with a speech akin to Matt Smith’s “hello, I’m the Doctor” speech from The Eleventh Hour. If there was any doubt in anyone’s mind that this new actor WAS indeed the Doctor, the dialogue below should erase any and all doubt. “I tried to talk, I want you to remember that. I tried to reach out, I tried to understand you, but I think that you understand us perfectly. And I think that you just don’t care! And I don’t know whether you are here to invade, infiltrate or just replace us. I don’t suppose it really matters now, you are monsters! That is the role you seem determined to play, so it seems that I must play mine! The man that stops the monsters! I’m sending you back to your own dimension. Who knows? Some of you may even survive the trip, and if you do, remember this: you are not welcome here! This plane is protected! I am the Doctor! Peter Capaldi is the Doctor in…In the Forest of the Night. I enjoyed this episode even while sober!